Andy Simpkins reviews the digital oddity that is the 'Game On' Exhibition at the Science Museum, Kensington, London, 3rd February 2007 and indulges in some classic video gaming ponderings as well. It all seems like yesterday. I had just started my first job. I was a callow youth of some eighteen summers and I had money burning a hole in my pockets. Apart from buying various t-shirts depicting my favourite bands of the moment, going out with friends to various local hostelries, I as well as numerous others of my peers, had an interest in video games. Not the hand-held , sleek and up to date creations like the PSP, Game Boys and their ilk, no what I am talking about were the coin-operated behemoths that loomed monolithic-like in garishly carpeted and wallpapered halls. Beckon, they did with their Moog-inspired music and to todays eye, very primitive graphics indeed. The Science Museum in Kensington, London had the forethought to cater to those people who remember the halcyon days of the video game boom of the late '70s and the early '80s in the form of the 'Game On' Exhibition. Showing the genesis of the video game from its earliest beginnings in the hulking cabinet full of valves and dusty circuit boards that was 'Space War' through the days of 'Pong', even though a very primitive game, set a benchmark for its contemporaries and spawned may imitators, to the classics like Space Invaders. Pac-Man, Frogger, Track and Field, Galaxian, Missile Command and a host of others. Next came the evolution of the games console like the Atari, the Jaguar, Nintendos NES and Super NES through to the Gamecube, PlayStation and the X-Box culminating in the Nintendo Wii and the PlayStation 3. 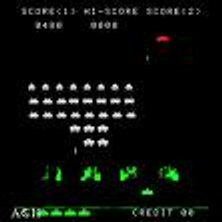 One of the machines always seemed to have a crowd around it and the I learned was the very first Space Invaders game. I could not get near the machine ever for love nor money and had to make do with watching from afar. When I had the chance to get near it and peek over someones shoulder, could see the rows of aliens criss-crossing the screen but could never understand why it looked like they were doing aerobics with their raising and lowering of limbs and their shuffling sideways like extra-terrestrial crabs.... They had an example of the newer Invaders game at the Game On exhibition, unfortunately not in working order though, but this came complete with an example of a resin-formed green alien head affixed to the top of the cabinet. This fixture was designed back in the early 80's by Roger Dean, the well-known album cover artist and designer. Apparently, these machines are much sought after and can command a respectable price if you are lucky enough to find one on eBay. Around the same time, Asteroids and Lunar Lander were coming into their own. With its thud..thud..thud noise being pounded out continually just to set your nerves on edge, the jagged lumps of rock that went off in all directions when you blew them up and that annoying little flying saucer that flew around firing off salvoes and not trying very hard to hit you. My long-suffering girlfriend had to contend with the sight of me shouting “You bu**er! !” and shaking my fist at the machine. 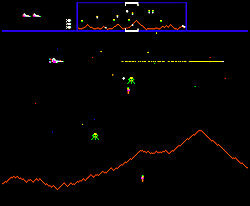 Lunar Lander was a game where you had to use a lot of hand/eye coordination and some thought. Piloting a lunar module down from orbit to land on a very small ledge using the least amount of fuel possible was taxing and running out of fuel halfway through your final descent, crashing and seeing the lander break up in slow motion was frustrating, to say the least. The next step on from Space invaders were the wire-frame animation games like Tank Command, where you drove a futuristic tank across a barren landscape basically blowing up any and everything that crossed your path. Occasionally, you would see a flying saucer, hovering very closely to the ground and moving about in an infuriatingly erratic manner. I can recall cursing soundly as I rarely, if ever, hit one of the bloody things. Tail Gunner I only played the once but was entertaing. 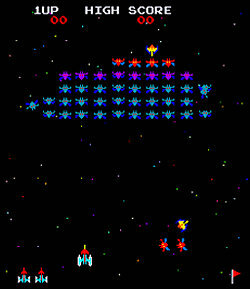 Wire-frame graphics again and you had to have quick reflexes to shoot down as many enemy fighters as you could. 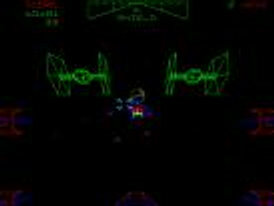 The first Star Wars video game was a wire-frame graphics game with a mock up of a Rebellion forces X-wing fighter cockpit built around it. The game started of with the familiar opening words of the Star Wars films scrolling upwards into infinity. Then followed poorly synthesised music from the original trilogy of films providing a backing soundtrack as you were Luke Skywalker, leading the rebel forces into attack on the Death Star. 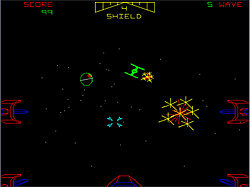 The first part of the game had you battling against successive waves of Tie fighters throwing fireballs at you. All your attention was focused on shooting the fireballs and hitting the Tie fighters as well so you were almost too pre-occupied to notice Darth Vaders Tie fighter, flitting around in the background, throwing the odd potshot in for good measure. Due to what happened in the films, whenever you hit Darth Vaders ship, it merely spun off the screen, momentarily out of control, as opposed to being blown up. My boss at work; Dave, is somewhat unaffectionately known as Darth Vader, and, during the heat of battle, I hit DV's ship and somewhat triumphantly shouted: ”I've hit Daves ship!” much to the bemusement of my girlfriend. The second part of the game involved flying down onto the surface of the Death Star where you had to shoot gun emplacements placed on the top of slowly growing towers. Apart from shooting the ubiquitous fireballs, you had to blow up as many of the gun emplacements as you could. As to the culmination of the game, it was into the canyon where you had to shoot and destroy gun emplacements but had to dodge barriers by flying over or beneath them until you reached the exhaust port and shot your load in the hope that it caused the catastrophic explosion. As you pulled away from the Death Star, you could hear Alec Guinness' voice bestowing beatitudes upon you but also for a brief moment, markings on the surface of the Death Star spelt our May The Force Be With You...The one at the Game On exhibition had a lot of people gathered around it and it was a flashback to my youth where you had to form an orderly queue in order to play it. Going back to what I was saying earlier about being a callow spotty-faced youth with money to burn and all that, Brighton has always had a special place in my affections. Apart from it being home to a Heavy Rock nightclub that I used to frequent almost every Saturday night where my good friends of the time and myself used to drain the place dry of Newcastle Brown Ale and stumble out of at some ungodly hour of the morning, Brighton, by its very nature as a seaside resort resplendant with sticks of rock, fish and chips, candy floss and kiss-me-quick hats, was also playing host to a multitude of amusement arcades, bulging at the seams with the latest video games. 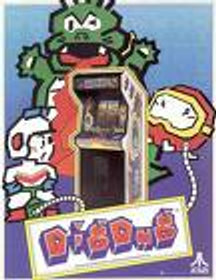 Dig Dug I have a particular fondness for as it was a very strange but endearing game. Basically, you had to steer a little character armed with a shovel and a footpump below ground in order to blow up Fygars: which were basically baby firebreathing dragons and Pookas;which looked for all the world like red billiard balls with little arms and legs and wearing ski-goggles. You could either, when cornering one of the beasties, blow it up with the footpump and the hose which snaked out in an alarmingly phallic manner to 'penetrate' and pump them up until they exploded or have them chase you under large boulders that would fall down into the tunnel that you were digging and squish them. Sometimes, one of them would make it to the surface and either scamper or bounce off to freedom. The one I was playing at GO was a perfect working example but the joystick was showing signs of age and did not properly steer the character downwards so I did meet an untimely demise, not through lack of expertise but due to mechanical failure. If the machine had bee working properly, I think I could have taken on all comers and subjected them to a humiliating defeat. You may have noticed that one of my favourite films is Tron which I have been told on more than one occasion has acquired something of a cult status. At least I think they said 'cult'.... I can clearly remember going to see it back in 1983 over at the local flea-pit at East Grinstead. Apart from being lead out of the cinema by my friend Alan who can remember me incessantly dazedly mumbling :”...best film ever...”. It also left its mark on me as the first film to include computer-generated imagery. This was another game that my hands almost seemed permanently affixed to and I used to rack up impressive scores on it. The game was divided into four sections and each section had to be completed before you could move onto the next level. You could either choose between the Light Cycle arena where you were pitted against 1 to 3 enemy lightcycles. Playing against one was a piece of cake as it was programmed to follow your movements so it was a fairly simple affair to box it in and see it crash. When you went up against three, the odds were stacked against you but again, they were programmed to follow your moves. All I had to do was move up the screen until they were all following me then move to the left on the grid and they would all crash into my jet wall or each other. 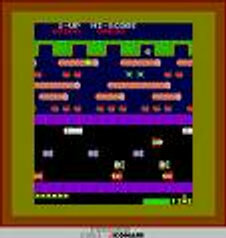 The second section was the Tank Battle where you were the program Clu, in charge of your own Game Grid tank driving up an down the canyons of the Electronic world looking for and destroying enemy tanks. 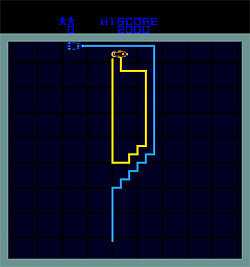 As you progressed up the levels, the tanks were replaced by the non-firing but quicker Recognisers. The third zone you went to was where you had to throw your disc at Grid Bugs;spider like creatures that swarmed all over the place and generally mad e a nuisance of themselves and finally there you confronted the mighty Master Control Program and had to successively throw your power disc at the moving blocks barring your escape. As you moved up the levels, the blocks more and more quickly and you stood more chance of being derezzed if one of them hit you. Discs Of Tron was a worthy successor to Tron and followed in the same vein. It was based on the section in the film where Flynn and Crom; played by Babylon 5's Peter Jurasik, are having the Jai Alai contest on the rings suspended in mid-air, but are throwing power discs at each other and the game became more difficult by your opponent throwing something akin to an electric bolas at you that followed around and could not be deflected but had to be destroyed by you frantically recalling your disc and running between the rings that had by that time had to lower and raise themselves so in addition to throwing and recalling your disc, you had to wait until you could run and jump onto another ring, all the while being remorselessly pursued by the bolas. This machine also had a film-based soundtrack and included the voice of the malovalent Command Program Sark, mocking and taunting you. One thing I did notice about the GO exhibition was the games and how the age of the attendees was sharply delineated by them. Invariably, the kids would be invariably playing the handheld consoles like the GameBoys and the PSPs and their fathers, being enveloped in a paternal aura of pride and nostalgia, would be playing most of the games I have already mentioned, in an attempt to recapture those days when they were care free adolescents and not middle-aged with an expanding waistline, a receding hairline and a loving wife and a mortgage at home. If ever there was a game that had you breathing heavily and dripping with perspiration afterwards, it was Track And Field. Whether you played the version with the buttons for the two-directional joystick for movement, the game was an absolute swine to play. Based loosely upon the Olympics, you started off with the Hundred Metres. 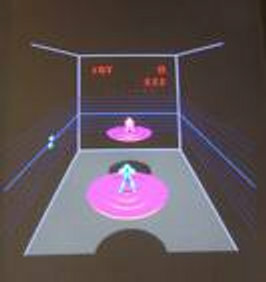 If you were up against the computer, you had a split screen showing you and your opponent on the starting blocks. 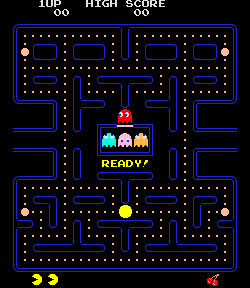 What happened next makes Repetitive Strain Injury seem trivial in comparison!Depending on how muscular your arms were, it involved repeated slamming the buttons for running or moving the joystick backwards and forwards as maniacally as you could to build up a decent running speed. Once the pain had died down in your fingertips and arms, you could look at the screen to see if you had beaten your opponent. If you had won, your sprite would be waving its arms triumphantly at the finish line or conversely, would be rubbing tears from its eyes. The 110 metres hurdles only exacerbated things. As well as slapping the buttons like a maniac, you also had to time jabbing the jump button just right to leap over the hurdles without your sprite falling flat on his face. Other things I must mention about GO were the sections devoted to the early gaming consoles. A few years ago, I went to the computer museum at Bletchley Park, just outside Milton Keynes. 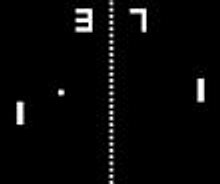 Apart from being a rest home for the past relics of the early computer age, it also serves as a repository for some of the earliest computer games consoles ever produced including versions of Pong made for the home market. Moving on from the gallery containing all the early arcade games was the area holding all the hand held video games. From their genesis in the form of the earliest versions of Space Invaders with their primitive LED and LCD screens through to the latest PSPs and Nintendo DS's. A large display case held the early versions of Frogger and others of its stable mates. This was, in turn flanked by benches at which you could play the latest games and some of their earlier predecessors as well. As it was a Saturday, the halls were fairly full and there was a troupe of scouts and girl guides, accompanied by various harassed looking pack leaders. The hand held games were keeping the majority of them in check but most of the time, they were getting in the way as they were hogging the games that I wanted to play and were generally crawling around like crabs underfoot. Either that or they were sitting rapt in playing a game and getting their endorphin hit like a rat with the pleasure centre its brain constantly getting stimulated. Bless their little cotton socks... One of the landmarks of the handheld video game revolution was the invention of the Nintendo Gameboy and its games, in particular the peculiar phenomenon that is Pokemon and the cult it spawned. Nearby, was a display case containing some examples of the early Gameboys, some of the games it spawned and various examples of Nintendo, Gameboy and Pokemon merchandise. The culmination of GO lay in the last gallery. This was where the latest generation of console games, in the form of the Playstation 3 and the Nintendo Wii were being demonstrated. The Playstation 3 was very impressive as a game called Guitar Hero was being showcased. Basically, you were given something strongly resembling a childs toy guitar which was linked up to the console. Up on the screen was a very convincing computer-rendered version of a long-haired denim and leather Heavy Rock or a spikey-haired Punk Rocker clutching either a Fender Stratocaster or a Gibson Les Paul. The idea of the game was to, using the plastic guitars was to touch various areas on the 'fretboard' of the guitar to simulate notes and to play various rock classics. Two wanna-be rock guitarists were having a fair stab at Joan Jett and|The Blackhearts “I Love Rock And Roll”. Moving along was the Nintendo Wii. My esteemed colleague on this site and would-be world dictator:Adam Purcell, recently came into possession of one of these consoles and I was very impressed by it. As oppposed to the traditional game pad hand controller which I am completely cack-handed at, there is a simple hand controller, called a 'nunchuk' which has a motion sensor build into it. Any movement in 3D space was translated into movement on the screen. Lets just say that the sprites on the screen were 'idiosyncratic' in their rendering, the quality of the graphics was faultless and I can see why this game has appeal, especially to those who, like yours truly, have decidedly poor coordination where it comes to game pads and hand controllers. Yes, all the game I played up at GO were showing signs of age and decidedly looked like they belonged to a past and better era but despite video games nowadays having graphics that have an almost lifelike feel to them, the games of my youth hearken back to a more innocent age and paved the way for todays games.